Evaporation is a terrific rejuvenation of the milk pitcher effect. It's time to throw away your grandpa's milk pitcher, and get ready for Evaporation! This is brand new method for making liquid disappear! Self contained, so when travelling you don't need 2 containers (one to carry the liquid and then one for the trick)! No refilling, the liquid never leaves the container! Resets in less than 3 seconds! Can handle bottle freely (unlike a milk pitcher, ghost glass, etc), you can even juggle it! Is physically smaller than a milk pitcher, but equally as visual! Evaporation works close up or on stage! At any point in your show, you pick up a bottle of juice that's been sitting on the table and pour it into a hat, cup, newspaper, your closed fist, or some other container and the juice disappears! Or better yet the juice changes to something else! You get the Evaporation gimmick, DVD and printed instructions. 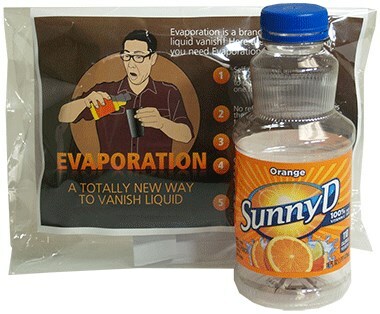 The Evaporation gimmick is available in orange juice bottles, and the DVD teaches you how to use your gimmick along with many ways to use Evaporation. Awesome effect with lots of utilities and very workable. Very modernized version of the milk pitcher effect and very portable. I'm glad you can use different colored liquids as well. Would highly recommend this!